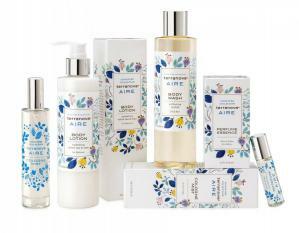 Embrace your natural beauty with Aire, a light-on-your-feet, feminine scent that slips on with ease like a favorite soft sweater. Graceful freesia and muguet mingle with clean citrus and white tea, while sensuous oak moss and sheer musk warm this modern classic. Always perfectly fitting. All paraben, sulfate and color-free. CONTAINS: WATER, SODIUM C14-16 OLEPHIN SULFONATE, COCAMIDOPROPYL BETAINE, COCAMIDOPROPYLAMINE OXIDE, COCAMIDOPROPYL HYDROXYSULTAINE, SODIUM METHYL LAUROYL TAURATE, FRAGRANCE, COCAMIDE DIPA, PEG-50 SHEA BUTTER, ALOE BARBADENSIS LEAF JUICE,CYMBIDIUM GRANDIFLORUM (ORCHID) FLOWER, JASMINUM OFFICINALE (JASMINE), CAMELLIA SINENSIS (WHITE TEA) LEAF* & AVENA SATIVA (OAT) KERNEL EXTRACTS; PANTHENOL (PRO-VITAMIN B5), SODIUM BENZOATE, PHENOXYETHANOL, PPG-2 HYDROXYETHYL COCO/ISOSTEARAMIDE, PROPANEDIOL “ZEMEA”, TETRASODIUM GLUTAMATE DIACETATE, TOCOPHEROL, POTASSIUM SORBATE, SODIUM PCA, GLYCERIN, DECYL GLUCOSIDE, CITRIC ACID. *CERTIFIED ORGANIC. CONTAINS: CARTHAMUS TINCTORIUS (HYBRID SAFFLOWER) OIL, FRAGRANCE, OENOTHERA BIENNIS (EVENING PRIMROSE) OIL, TOCOPHERYL (VITAMIN E) ACETATE.